The Federative Republic o Brazil is a union o twinty-seiven Federative Units (Portuguese: Unidades Federativas (UF)): twinty-sax states (estados; singular estado) an ane federal destrict (Distrito Federal), whare is locatit the federal caipital, Brasília. The states are generally based on historical, conventional borders which hae developit ower time. The federal destrict is no a state in its awn right, but shares some characteristics o a state an some o a municipality. The Federal Destrict is bordered bi the states o Goiás an Minas Gerais. The codes gien belaw are defined in ISO 3166-2:BR. The first admeenistrative diveesions o Brazil wur the hereditary caiptaincies (capitanias hereditárias), stretches o laund leased tae Portuguese noblemen or merchants wi a chairter tae colonize the laund. The caiptaincies wur tae be passed frae faither tae son, but the croun retained the pouer o revokin it, which the keeng indeed did in the 16t century. Then the vast Portuguese dominion in Sooth Americae wis dividit atween the State o Brazil, in the soothren hauf, an the State o Maranhão, in the northren hauf (note that Maranhão bi then referred no anerlie tae current Maranhão, but rather tae the whole o the Amazon region; the name marã-nã in auld Tupi leid means "wide river", i.e. the Amazon River). Efter the Iberie Union (1580–1640), the territory o Portuguese colonial domains in Sooth Americae wis mair nor doubled, an the laund wis dividit intae caiptaincies, ryal caiptaincies an provinces. Unlik Spainyie Americae, the whole territory wis unitit unner a single viceroy, wi a seat in Salvador (an efter 1763, Rio de Janeiro). This situation contributit later tae keepin Brazil as a unifeed naition-state an avoidin the fragmentation o the Spainyie domains. Wi unthirldom, in 1822, the colony became an empire an aw caiptaincies wur turned intae provinces. Maist internal borders wur kept unchyngit frae the colonial period, generally follaein naitural featurs sic as rivers an muntain ridges. Minor chynges wur made tae suit domestic politics (sic as the Triângulo Mineiro frae Goiás tae Minas Gerais, the splittin o Paraná an the left bank o the São Francisco River frae Pernambuco tae Bahia), as well as additions resultin frae diplomatic dounset o territorial disputes bi the end o the 19t century (Amapá, Roraima, Palmas). Whan Brazil became a republic in 1889, aw provinces wur immediately turned intae states. In 1943, wi the entrance o Brazil intae the Seicont Warld War, the Vargas regime detached seiven strategic territories frae the mairch o the kintra in order tae admeenister them directly: Amapá, Rio Branco, Acre, Guaporé, Ponta Porã, Iguaçu an the airchipelago o Fernando de Noronha. 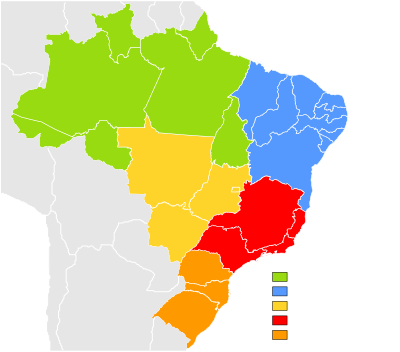 Efter the war, the first three territories became states, wi Rio Branco an Guaporé bein renamit Roraima an Rondônia, respectively, whilst Ponta Porã an Iguaçu remained as territories. In 1988, Fernando de Noronha became pairt o Pernambuco. In 1960, the square-shapit Distrito Federal wis carvit oot o Goiás in preparation for the new caipital, Brasília. The previous federal destrict became the state o Guanabara till in 1975 it wis mergit wi the state o Rio de Janeiro, retainin its name an wi the municipality o Rio de Janeiro as its caipital. In 1977, Mato Grosso wis split intae twa states. The northren aurie retained the name Mato Grosso while the soothren aurie became the state o Mato Grosso do Sul, wi Campo Grande as its caipital. The new Mato Grosso do Sul incorporatit the territory o Ponta Porã an the northren pairt o Iguaçu. Central Iguaçu went tae Paraná, an soothren Iguaçu went tae Santa Catarina. In 1988, the northren portion o Goiás became the state o Tocantins, wi Palmas as its caipital. On 11 December 2011, a plebiscite wis held in the state o Pará tae consult the population aboot the possibility o splittin the state o Pará intae three different states (Pará, Tapajós an Carajás). Baith Tapajós an Carajás wur rejectit bi the population. This page wis last eeditit on 21 Julie 2018, at 05:54.